The Canned Food Drive started on December 3rd and ended on December 18th. Students deposited their canned foods in their day 2 period 2 classes. The goal this year was 27,000 cans and 100% class participation. We were still the school with the most cans for the third year in a row but unfortunately, we did not reach our goal. This year, Century had 90% class participation and 19,000 cans. Last year, Century collected 25,667 cans, and had 93% class participation. “Last year two high schools got around 13,000 cans and one got 9,000.” Said the activities director and Student Government teacher Mr. Thomas. Glencoe came in second last year, with 13,256 cans, Hilhi taking third with 10,135 cans, and Liberty landing in last place with 6,444 cans. “For the school, this to me, more than anything, summarizes the heart of Century. Our staff and students are caring and thoughtful and it shows in the amount that we donate and the support that we give our own community.” states Thomas. The canned food drive is incredibly important to Century, and despite being a new teacher, he is well aware of this. Mr. Thomas stated that if every student in school brought ten cans each, we would easily reach our goal of 27,000. Doing can drives have always been important for the community especially for people living under the poverty line and the less fortunate. Kellie Meeuwsen is a fellow Century High student that donated about 5 cans last year. “I was really happy that the cans were going to a good cause, and excited to see if my cans would help us win against the other high schools. And we did!” Kellie explained. “ Last year I donated a couple cans and the band also went out and did our can drive like normal but we also collected food cans and we got at least 20-30 cans that way also. I think it’s nice because it helps the community even if we don’t realize how much these couple of cans we donate can impact people’s lives.” Says Sunny Cai, another student of Century’s. Like every year, there are rewards and motivation. The competition is split up into north side versus south side versus Mr. Bohm. The winning side (Mr. Bohm) will receive a hot chocolate bar, and the top class to bring the most cans will be awarded a pizza party. Even though the reward for the winning class or classes is getting a few slices of pizza and a hot chocolate bar, it is important that we are motivated just by being able to provide for people who have a harder time providing for themselves and it is important to let people in our community not feel hungry. The Elks club feeds up to 650 families in Hillsboro, and the can drive can feed these families for up to six months. More people than we think are in this situation as well. 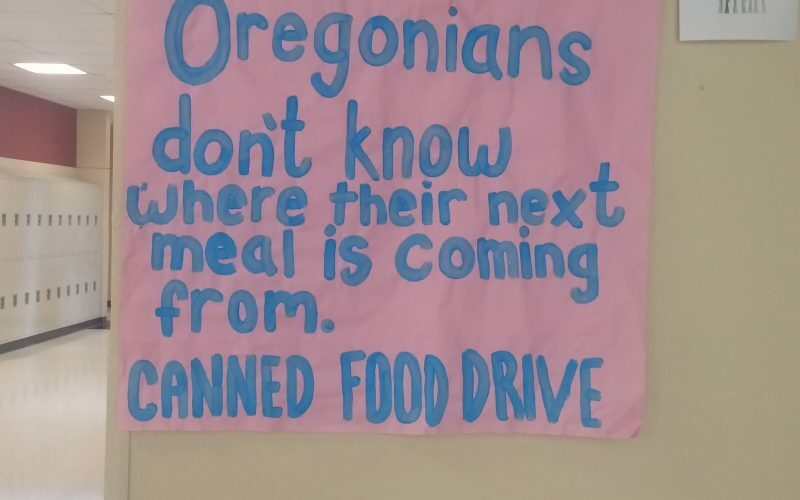 According to Mr.Bohm, “Some of these cans come right back to some of our students.” The can food drive not only helps the Hillsboro community, but helps our fellow students in this school as well. Even if you couldn’t spare any food at home, there were options to spare your time. Students signed up to collect cans at Albertsons, help pack food boxes at Elks, or collect door to door in the CHS feeder area. Recommended items included, peanut butter, baking needs, juice, rice and pasta, canned meat, boxed meals, soup, beans, boxed cereals, and baby food. Formula is not allowed. If you can not buy items separately, you can not separate them and count them as individual points. You get 1 point for every 10 pounds of fresh potatoes, 1 point for 2-packs of baby food, and one point for each box of packaged items. Items that do not count for individual points are water bottles, seasoning packets, and Top Ramen/ Cup Noodle kind of products. Century High School has 35% of students who are on free and reduced lunches and the entirety of the Hillsboro School district is closer to 44% free and reduced lunch which means that students may have less access to food over the winter break.